shmups.system11.org • View topic - Damaged Extron BNC Ports Fix? Damaged Extron BNC Ports Fix? Post subject: Damaged Extron BNC Ports Fix? 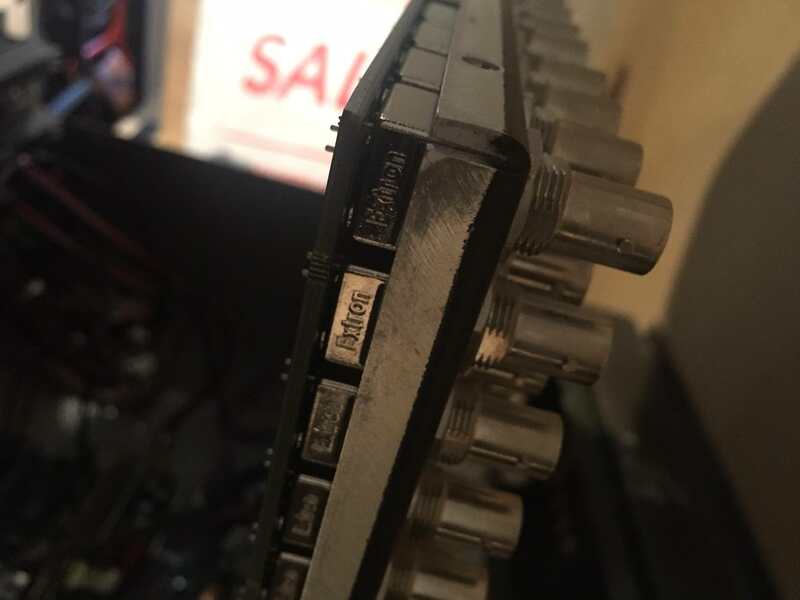 Hey, so I ended up picking up an Extron Matrix Switcher 450 Plus Series that is 32x32 recently but didn't notice until later that two of the bnc connectors are damaged. From just looking at it they should still be functional but if I wanted to go about replacing these connectors does anyone know if this is an easy fix? Do I have to buy another Extron Matrix Switcher to take parts from it to fix it or is there an easier solution? 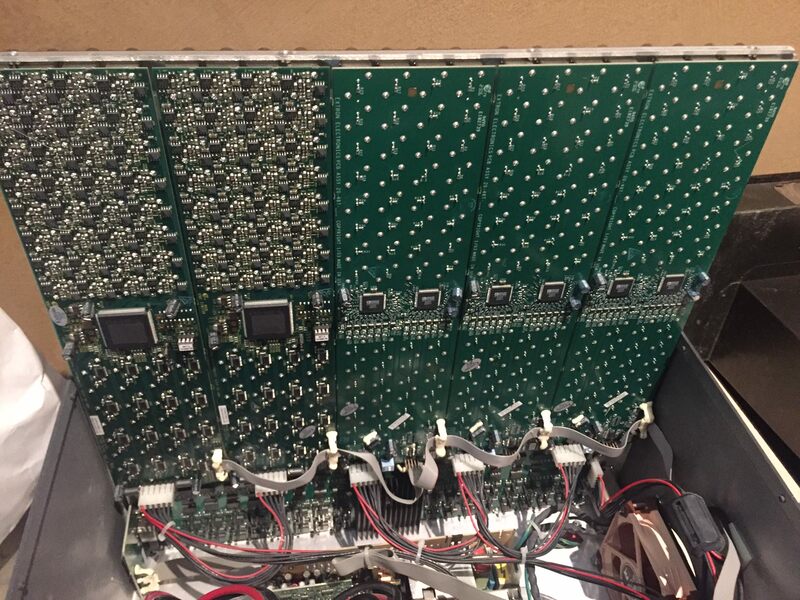 Post subject: Re: Damaged Extron BNC Ports Fix? If I had to guess without seeing the internals, you're looking at removing the front panel, unscrewing all of those BNC connectors to get that rear board out, and some soldering work to swap the busted connectors for new ones. As for parts, you can probably pick up new BNC connectors on Digikey, but, unless there's someone here who can tell you outright which parts to buy, you probably won't know until you pull that board. 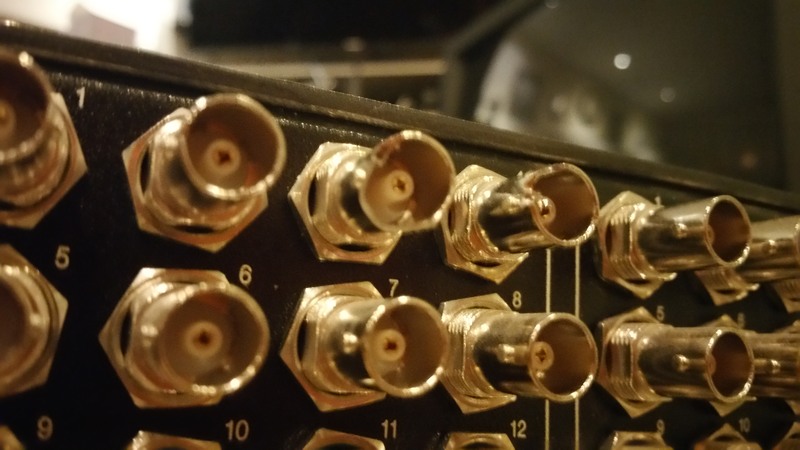 Is it even worth bothering with when there are 31 other inputs or outputs? Is it just a bulkhead connector or are those actually soldered on the other side. A bulkhead connector or panel mount bnc should be fine from mouser/digikey. Would one of you be able to link me what I would actually want to buy. Unsure what the other end looks like. Later tonight if I have the tools I will end up opening it up and trying to take pictures of the inside. Thanks for suggesting two sites for me to look at though. Well it's two connectors input 3 and input 4 so that brings it down to 30 instead of 32 my ocd would bug me too much skipping those inputs I'd rather just fix it plus eventually I'll probably end up needing them. Plus I'm with in the return time period so I'm trying to see how much it would cost me to fix it and how easy it would be to fix it. How bad is your OCD? You'll be removing 64 nuts off the BNC connectors to remove that board to then desolder the damaged BNC connectors. Big job. Those female PCB mount BNC connectors are actually an Extron part. I'd be contacting Extron spare parts and seeing if they can supply you with some. You could get lucky and something like this BNC connector from RS might be the right fit. Woah, I appreciate the photos and information. So I simply undo 64 bolts which doesn't seem complicated as long as you remember where they all go. Is it difficult to solder them back in? I personally have soldered before but I could probably get my wife to help with that part. Also did you end up installing a Noctua fan into your matrix switcher, lol? I might have to open it up just for that alone lol. Other question is could I not get a new pcb with non damaged bnc connectors? Does it not slot in like a graphics card would into a computer? I noticed that on other Extra Matrix switcher models they have plastic protectors on unused slots. I imagine that it is only four points that need to be soldered. GND, signal and the two metal mounting posts to secure the BNC connector to the PCB. The more difficult part will be desoldering the broken BNC connector if you don't have the right tools or experience. Looking at your photo again, I still think that male BNC connectors would still connect and lock on to the two damaged connectors (have you tried?) and that there is no need to risk damaging your Crosspoint by trying to replace them. The outer metal part is just the GND connection, so there is still sufficient surface material there (from what I can see) for a good GND signal IMHO. I'm not sure what your chances would be like to find one of the right boards in the 32x32 range that you need to replace. Pretty slim I would think. The larger Crosspoints have two very LOUD 12v fans. Have you turned your Crosspoint on and heard them? I replaced mine with Noctua fans and monitored the temps via the Extron Crosspoint Management software and all appears to be fine (however I still want to do some more testing during longer gaming sessions). My 32x32 Crosspoint is now almost silent after changing them over. Well, I might just clean up the broken spots so they are smoothed out and do some comparisons to see if everything looks fine. As for replacing the pcb board could I not buy another 3230 crosspoint that might be for parts only and just swap mine out for the others? That shouldn't require any soldering and should also fix the issue, correct? Also I'm not sure if Extron sells that part separately but I'll look into it this week or next. By the way keep me updated if you can with the noctua fan. I'm interested in doing that myself. Have you had any personal experience with trying to replace fans in CRTs? I'm wanting to do that on my Mega View monitor. And who ended up giving you the software for the Crosspoint? Extron wasn't wanting to do it directly for me but told me one of their disturbers might do it. Also who do you get your bnc to bnc cords from that have enough slack for the 32x32? As for replacing the pcb board could I not buy another 3230 crosspoint that might be for parts only and just swap mine out for the others? That shouldn't require any soldering and should also fix the issue, correct? I would expect another Crosspoint to work just fine, so it'd probably be easier to just use the new one and keep your current busted one for parts. Well I meant buying a damaged cross point and just swapping out the one PCB to fix mine. As it would be cheaper to buy a damaged one then a working one. Just trying to think of my options before the return policy ends. It's not busted just bent. Just bend them out as well as you can or file the crappy bits down, not worth the worry of replacing or repairing. If your OCD still can't handle the bent bnc just get some bnc to rca adapters and hammer the suckers on and use those for some rca based console. What you cant see can't bother you..